Renovated in 2011, this hotel offers modern rooms with free Wi-Fi and a breakfast buffet. It stands in the historic Bad Cannstatt district of Stuttgart, just 150 metres from the Mineralbad Pool. Only 5 km from the centre of Stuttgart, the non-smoking ibis Styles Stuttgart offers air-conditioned rooms with satellite TV and a private bathroom with shower. The Vinage restaurant serves breakfast and a wide range of regional and international dishes. The Success Lounge bar has imaginative cocktails, speciality coffees and snacks on the menu. Free tea, coffee, and water are provided in the lobby until 22:00. 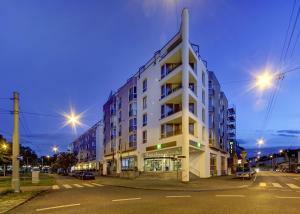 The ibis Styles Stuttgart is less than 2.5 km from the popular Wilhelma Zoo. The Kursaal Tram Stop is a 2-minute walk away. From here, the city centre can be reached in 12 minutes.